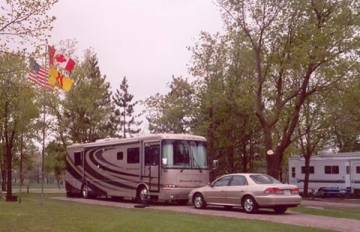 Description: ...20 acres of maples, oaks and lawns,... close to big-city sights-and 17 miles to the Minneapolis Convention Center... some Pull thru sites stretch up to 90 feet, and full-hookup sites include telephone service & Wi-Fi. ...On-site mini golf, horseshoes, basketball, a playground, game room and swimming pool. Cons: Wifi does not work; phone quote was $10 short! oh - you wanted hookups??!! This is the second year in a row that we have stayed here. It is very close to downtown and other venues for the US Open Racquetball Championship at Target Center. Maple Grove is a very lovely town with great places to eat and shop. We will be back next October for sure.